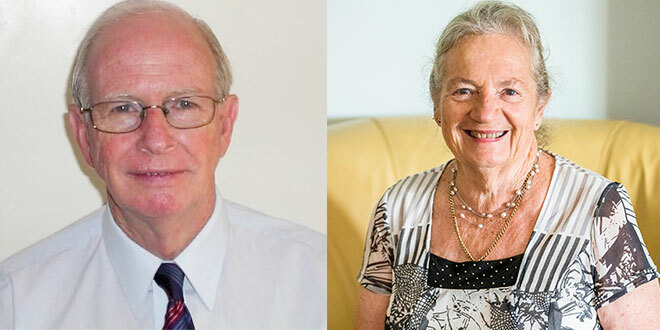 Honoured: Educator Dr Rod Campbell and Warwick parishioner Margaret Miller were among the Catholics honoured on Australia Day last week. MARGARET Miller’s mission to stop young children dying of leukaemia and her dedication to the Warwick community has landed the Catholic parishioner an Australia Day honour. The former nurse helped start the Warwick branch of the Leukaemia Foundation when her son Robin died of the blood cancer. Mrs Miller said Robin was sick between March and December of 1979 from an “aggressive leukaemia” which was incurable. He was 11 years old and the second of four children. The family stayed with relatives in Chermside when Robin needed to visit the hospital. Mrs Miller, who was “born and bred” at St Mary’s Church, Warwick, prayed endlessly to God to help her son and family get through the traumatic year. “I think He got sick of me in the end,” she said. During their returns to Warwick, Robin asked one of his mum’s friends, a volunteer for the famous Margie’s Tea House, which was also started by Mrs Miller, “to put on a garden party” for the Leukaemia Foundation. “Robin wanted to raise some money to give back to the Leukaemia Foundation, which was still pretty new at that time, to thank them for all they’d done,” Mrs Miller said. People came as far as Brisbane to attend Robin’s garden party. That fundraiser led Mrs Miller to forming the first Warwick branch of the Leukaemia Foundation. Collectively, the smaller Leukaemia Foundation branches in Queensland, which includes Warwick, raised $186,700 in the last financial year. Mrs Miller was president of the foundation in Warwick for 30 years and is now the support person for families of people with the disease. “I started the Leukaemia Foundation (in Warwick) in honour of my son,” she said. Mrs Miller said her hope was to relieve the trauma many families experienced when they saw their child suffer from cancer. “My son died of leukaemia, but I can stop other little kids from going down that road,” she said. For her service to the Warwick community, including a long-standing career as a nurse and a sandwich maker for volunteers of the Warwick Rodeo Show for 50 years, Mrs Miller was awarded a medal of the Order of Australia. “I’m proud, I’m excited but I’m embarrassed,” Mrs Miller said. “I can’t get into my head what I must have done to get the honour. Mrs Miller has three other children, seven grandchildren and three great-grandchildren. Other Queenslanders associated with the Catholic Church who made the Australia Day honours list include swimming legend “Madame Butterfly” Susie O’Neill, former Mater Health Services Brisbane chief executive officer Dr John O’Connell, Southport parishioner Michael John Kyle, and long-time educator Dr Rod Campbell. Dr Campbell is a renowned Australian literacy educator and was appointed a Member of the Order of Australia for his services to education. His career spans 55 years, teaching in primary, secondary and special schools, but is best known for training senior school teachers “how to teach from spoken language” to the written word. He has published 17 books on teaching English grammar and literacy, and will release a further three books this year. Despite his great contribution to Australian education, Dr Campbell was uanble able to receive an education due to his family’s financial situation. At age 15 he left school and worked in an insurance office but, through a “vocational theory of accident”, he fell in love with the idea of becoming a teacher. “I didn’t think about teaching until I worked in an office,” Dr Campbell said. He studied for his matriculation at night school for three years before going to teachers’ college. Dr Campbell also studied for his doctorate part-time, a process that took 36 years to complete and included years of teaching, receiving a teaching certificate, a degree, and Master’s degree and two diplomas, as well as raising a family. He said it was a privilege to be acknowledged on the Australia Day Honours list. “It’s nice to be recognised and I’m grateful for the nomination and to the people who supported that nomination,” Dr Campbell said. He said he was indebted, in his career, to “people in the last fifteen, sixteen years who have been supporting me”. “To get known, you need help from others,” he said. Dr Campbell is a member of the parish pastoral council for Our Lady and St Dympna’s Church, Aspley, and is married to Margaret Mary who is involved with Aspleycare, the parish’s social welfare arm. Dr Campbell said he recited a daily prayer for his career. “My prayers are, basically, that God helps me to do my work,” he said. When Dr Campbell isn’t writing books or training teachers in literacy and English grammar, he is a tour guide for St Stephen’s Cathedral and a presenter on 4MBS Classic FM every second Wednesday from 6am to 8am.